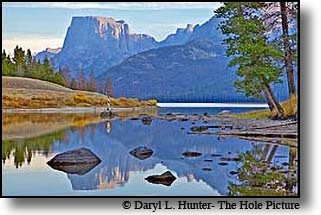 The source of the mighty Snake River is in Yellowstone National Park, from there it flows past Flagg Ranch south through the John D. Rockefeller, Jr. Memorial Parkway, and into postcard perfect Jackson Lake in Grand Teton National Park. Below Jackson Lake Dam, the Snake River meanders through Grand Teton National Park. Above the river to the west, the Grand Teton mountains rise suddenly, with no foothills to soften their dramatic rise to the sky. These are mountains the way we always expect mountains to look, The snowcapped, Grand Tetons are America's quintessential mountain range, rearing up with sawtooth like exaggeration crowned by the 13,770-foot Grand Teton. 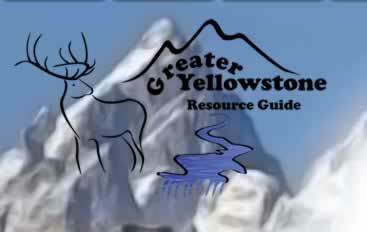 The abundant wildlife and lush landscape of the upper Snake River Valley, which is Jackson Hole, leaves a lasting impression in the mind of any visitor to Grand Teton National Park. 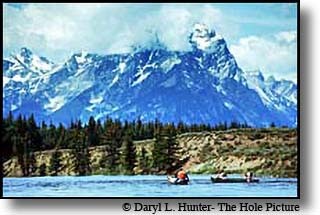 Approximately 50 miles of the 1056-mile long Snake River winds though Grand Teton National Park. 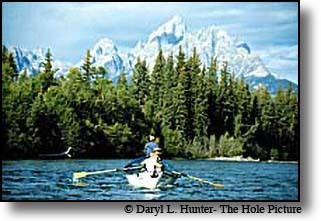 Areas around Snake River are a great place to spot wildlife, such as Moose, Bison, Elk, Beavers, Otters, Bald Eagles, and Ospreys, and there is hardly a better way to experience Grand Teton Park than floating or standing knee deep in one of it's treasures. Information on flow rates and additional caution areas are posted at river landings, visitor centers, the Rockefeller Parkway Ranger Station and the Buffalo Fork Ranger Station. Reports are updated whenever significant changes in river conditions occur. Even boaters that frequently float the Snake should check conditions before every trip, as the river can change overnight. River flow varies greatly throughout the summer as it is managed for irrigation. Submerged boulders can cause standing waves up to 3 feet high. The Flagg Ranch to Lizard Creek Snake River section is braided channel makes route-finding a challenge. After the Snake River winds through the Rockefeller Parkway for 6 miles, it flows into Jackson Lake. Jackson Lake Dam to Pacific Creek section provides scenic views, calm water and the few obstructions. This is a beautiful stretch of river well suited for touring kayaks, canoes, rafts and drift boats and is popular with all of the above. The Snake River meanders out of Jackson Lake, framed by the towering Grand Tetons. Many postcard photos have been taken of this section and the moose you will probably see there. 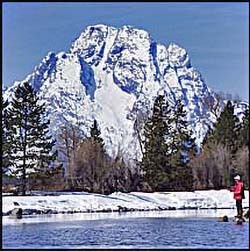 Oxbow Bend, just south of Jackson Lake Dam, presents exciting wildlife watching opportunities. Pacific Creek to Deadman's Bar section of the Snake is more difficult than the Pacific Creek section; this stretch of river has more drop which increases the current. 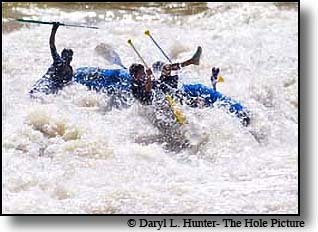 Braided channels make route finding challenging and requires more skill. 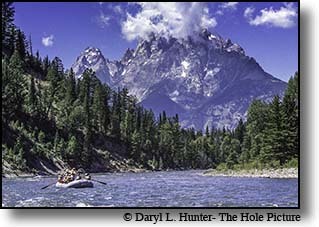 This is an incredibly scenic stretch of the Snake River with numerous opportunities to see wildlife and view or photograph the Cathadreal Group view of the Tetons. Deadman's Bar to Moose Landing is the most difficult section of the Snake River in the park, most river accidents occur on this section The here the Snake drops more steeply, with faster flows than in other sections south of Pacific Creek, giving boaters very little time to maneuver. Complex braiding obscures the main channel. 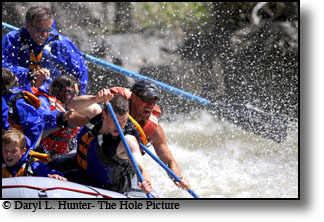 Strong current can sweep boaters into side channels blocked by logjams. 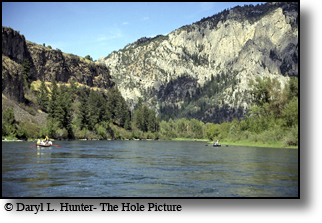 This is my favorite section of the upper Snake River to fish. 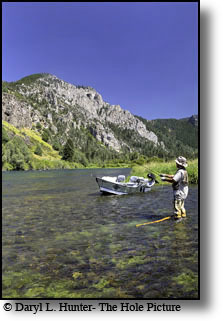 The Snake River is home to a unique subspecies of cutthroat trout known as the Fine-spotted Snake River Cutthroat Trout. This outstanding game fish is indigenous to the Snake River drainage and relies totally on natural reproduction. Having a wild trout fishery with indigenous trout is not something we take for granted and we highly encourage catch and release fishing to protect this valuable resource. One of the Fine-spotted Snake River Cutthroat most endearing qualities is its fondness for feeding on top sipping mayflies flies or attacking stoneflies, drakes and hoppers. Large dry flies like size 8 Turck Tarantulas, Royal Wulffs, Club Sandwiches, and hoppers are all popular and good choices. Size 6 and even 4 stone fly patterns sometimes are also effective. 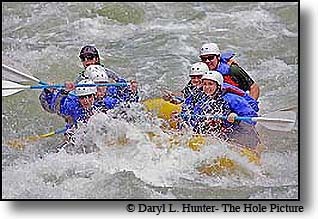 The Snake River is a large and swift river and can be dangerous. 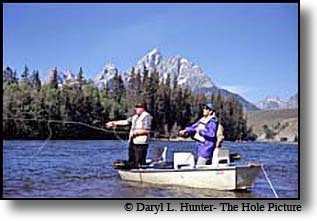 While wade fishing is certainly possible, and done all the time, the preferred method for fly-fishing is with a driftboat or raft. 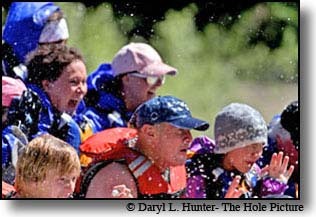 Canoes, rafts, and driftboats provide access to much more of the river than would otherwise be possible on foot but if you are in a canoe make sure you know what you are doing. 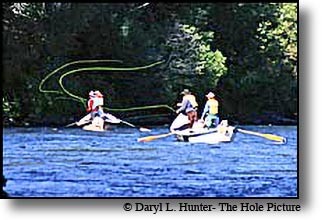 The key to fishing the banks of this river while floating is getting your fly as tight to the bank as possible and allowing it to drift just inches form the bank in most spots unless there is no current there. 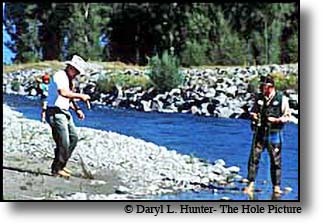 When fishing from a gravel bar it’s possible to hook and land a several fish in a row. These spots often provide good mayfly action. Whenever you see an obstruction like a root system of a fallen tree in the river drift your fly close to it as those are good fish lies and often provide large fish. 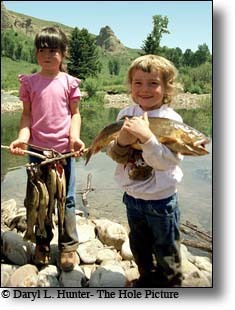 Trout season on the Snake River opens on April 1 and extends through October 31. Runoff typically starts around early to mid-May and can last well into July and even August in high snowpack years. That allows about a month and a half of fishing prior to spring runoff. 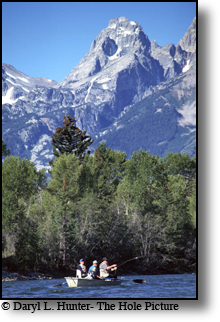 Early season fishing can be very good, but is not as consistent and productive as the fishing after spring runoff. Streamers are good choice this time of year. 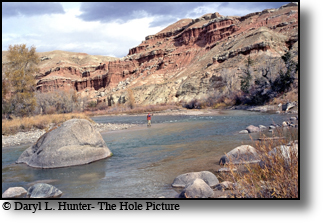 September is considered the best month for fishing the Snake but often times the good fishing will begin in August and last till the season ends in October. You will find sporadic hatches of stoneflies from April through September, midges all year round. Summer brings hatches of evening caddis and mayflies usually around midday. 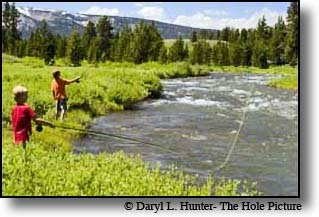 Once the river begins to clear in late July or early August, dry fly season begins in earnest. Wulffs, Stimulators, Humpys, Trudes, Royal Coachmans, Power Ants, Jay-Dave's Hopper and Turck Tarantulas are standard fare. Good streamers to use are JJ Specials, Woolly Buggers, Muddlers, Zonkers, Double Bunnies and Kiwi Muddlers. For nymphs, Hare's Ear, Pheasant Tails, Anderson's Golden Stone's, Halfbacks, Yuk Bugs, and Prince's Nymphs.